Here is a solution for a Script in Lawson Smart Office to detect the entry mode of an M3 panel: 1-Create, 2-Change, 3-Copy, 4-Delete, or 5-Display. This solution is useful for a scenario like this. Suppose your script dynamically adds an input field to an M3 panel. The input field could be used for example to enter a discount amount which will re-calculate a net value in another field. You would like to either enable that input field so that it becomes editable for the user, either disable it so that it is read-only. That will match the behavior of the M3 panel, for better usability. For that, you will need to tell apart if the user entered the M3 panel in Change mode or in Display mode. Ideally, we would like to use an API in Smart Office like GetEntryMode() that would return the entry mode. But there is no such API. Otherwise, we would like to simply read the Control’s properties such as IsReadOnly or IsEnabled. But somehow they incorrectly return false. The workaround is to read the LSTOPT value that is sent by the M3 panel when it makes the HTTP Request to the M3 server. That value is sent from panels A and B. Note that the option Create returns -1 (negative) instead of 1 (positive). The setter must be placed in the OnRequesting event handler of panel A or B. The getter must be attached in the panel (E, F, G, etc.) where you want to know the entry mode. 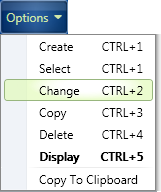 The technique works whether the user selects the option from the Options menu, or from double-clicking a record in panel B, or by selecting the option in the right-click context menu. Also, it works whether the users enters the M3 program via panel A or via panel B. Also, it works with multiple instances of the M3 program running at the same time. Also, it works with different M3 programs using the same script. UPDATE: Another technique is to get the XML response with controller.Runtime.Result, and to read the value of //Root/ControlData/Bookmark/@opt . Although not all programs have a bookmark.